AdhesionXtreme® waterproofing tapes include a range of superior quality leak-proof tapes that offer an immediate, permanent & guaranteed seal for all surfaces. The product range includes RoofBond® that features a UV stable backing in grey, white & black, MultiTask® that features a non-woven backing designed to accept all roof coatings, 2Sided® for sealing between two surfaces of similar or dissimilar materials and, InsulAtor® that is a vapour barrier for sealing the seams of insulation panels. AdhesionXtreme tapes are quick and easy to install. Remove the protective liner, install the tape onto the clean substrate and apply pressure with a roller. Water and weatherproofs all seam repairs. No primer required if the substrate is clean, dry & dust free. Laminated with a non-woven backing that is extremely flexible and designed to accept all roof coatings, paints or liquid urethane finishes. Excellent for sealing the edges of concrete basements or terraces prior to pouring the liquid urethane finish. 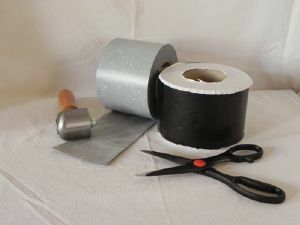 This tape features the adhesive formula on both surfaces and is designed for sealing between two substrates of either similar or dissimilar materials. The AX-400 aerosol spray primer is intended to aid the adhesion of sealing tapes to all roofing and building surfaces and is also recommended for sealing concrete surfaces prior to application of solvent based coatings and sealants. This is also recommended for wet, porous or fragile surfaces & tape installation below +5°C. The AX-900 Bio-based spray cleaner and degreasing agent is a non-toxic biodegradable cleaning spray composed of natural plant esters. It is intended for removing tar, asphaltand sealantsfrom equipment and building surfaces. It is also ideally suited for cleaning tools and equipment. The AX 900's slow evaporation rate and solvent power make it ideal for cleaning roof surfaces prior to application of sealing tapes. The SSR 50 silicone seam roller features a 50mm wide rolling surface and is intended to aid in the installation and fusion of tape to roofing surfaces as well as to remove entrapped air bubbles. The roller has a screw thread that can adapt to an extension handle.